The broadcasting industry’s latest entrant, Whyte Tv, is slowly but surely finding its footing in the game and hopes to make its mark in the following months and years to come. Founded in late March this year by a Jamaican by the name of “Doc Whyte” the web-based Ghanaian tv channel’s focus remains that of positively-impacting the lives of the society around it through its programming. “Whyte TV is a media/news company that gives out nothing but the best thought-provoking and genuinely life-altering content. Our daily interviews go a long way in tackling everyday issues that various communities within our society come face to face with on a daily basis. “We are a web based tv channel at the moment, something that makes it a lot easier for our viewers to receive our programming from wherever they are without any problems”, said the project’s representative, one Wisdom-K-Nartey, while speaking to Urban Craft magazine all the way from Ghana. Those behind the project strongly believe that the station will improve the relations between the media industry and the masses. Their goal is to of course to continue to go and one day be able to take their mission to a global audience. “Our short term goal is to be able to bridge the gap between media houses and the masses (voiceless) and improve how the two interact. “We want to make sure that every voice in our local communities has a chance to be heard, it is time we shared our stories and bring about the desired change. Everyone deserves to be heard since all of us as a whole play a significant part in decision making when it comes to the nation agenda. 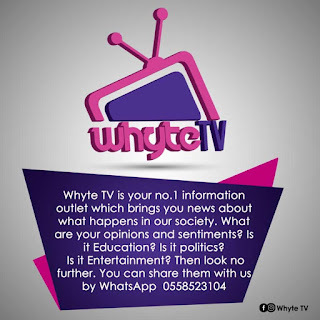 “Our long term goal definitely revolves around the idea of taking the brand #WhyteTV to the rest of the global village”, said the representative.